Special Savings Special Needs: Disability ministry done better...beyond Sunday morning and onto Wednesday dinner. Disability ministry done better...beyond Sunday morning and onto Wednesday dinner. I am blessed to overhear plenty of conversation on how churches can do disability ministry better. It's pretty good conversation! Tonight I was again reminded how much the small but PRACTICAL things matter. We have Wednesday evening dinner and small groups at Immanuel church of the Nazarene, or Lanznaz. Over the past few years we have typically come tearing in at the last possible moment to grab dinner (try to hide your surprise). In our defense, I doubt others had to get two additional grown people ready/bundled and loaded in the van after homework and showers...I'm grateful for our home health aid or we'd never even attemp it. For the first few years we slunk in trying to find openings to squeeze in at already full tables. Of course we can't just all split up and fill in tables since the girls need assistance so it caused all sorts of rearranging....let me remind you that families with special needs grow weary of causing so much disturbances. Many families simply stop coming. Today was a long day spent getting my mother admitted to the hospital. It's been a long frigid week in the northeast. 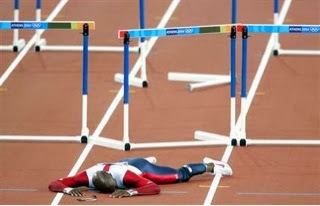 I'm just not in the mood to jump any more hurdles. I got home in time to get to church with the family. We walked in and sat down at our table. OUR table. You see, earlier this year we spoke up and said, "hey, we can't find a spot that works for us tonight, can someone set up another table?" They did. And not just any table....a rectangular table. All the other tables are round, but this one works well for us to pull in two wheelchairs. After verifying that it made us happy, someone decided to make it their project and reserved us a table each week. At first it felt a little weird, but not anymore! It is a HUGE relief to just pull right in and get down to the business of dinner! Tonight I looked at that sign and thought " I am so grateful!" This, for us, was disability ministry done better. It moved beyond Sunday mornings and made us welcome around the table later in the work week. It says "we want you here....we expect you here." 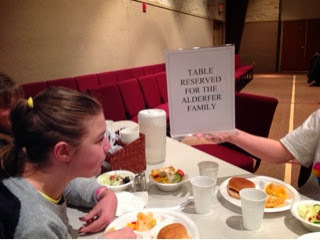 Kudos to our church family....thanks for making room for us at the banquet table.